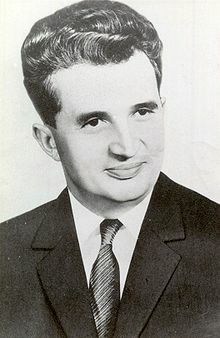 Nicolae Ceauşescu was the leader of Romania from 1965 to 1989 when he and his wife were executed by firing squad immediately after a two hour televised show trial on Christmas Day. The grand House of the Republic (Casa Republicii) he was building wasn’t finished at the time, and despite the fact it was a symbol of his repressive and increasingly brutal regime, it was completed after his death. Today it is called the Palace of the Parliament (Palatul Parlamentului) and houses the Romanian Chamber of Deputies, Legislative Council, Competition Council, and the Senate (pretty much the entire national leadership). Nicolae was born to poor parents, began work in a factory in Bucharest when he was 11 years old, and became a communist agitator in his youth. He was arrested and jailed several times for anti-fascist activities, and at one time shared a cell with Gheorghe Gheorghiu-Dej, a man who became his mentor and who later become the leader of the country. After World War II, Romania fell under Soviet influence, and the communists came into power in 1947. Ceauşescu quickly rose through the communist party ranks and held major leadership positions in the Romanian Government. When Gheorghiu-Dej died, Ceauşescu became the leader of the country. Ceauşescu was initially a popular with the Romanian people and viewed positively be Western leaders. Despite his being a communist country, it had an open foreign policy, collaborated with Western Europe, and was occasionally openly critical of the Soviet Union. 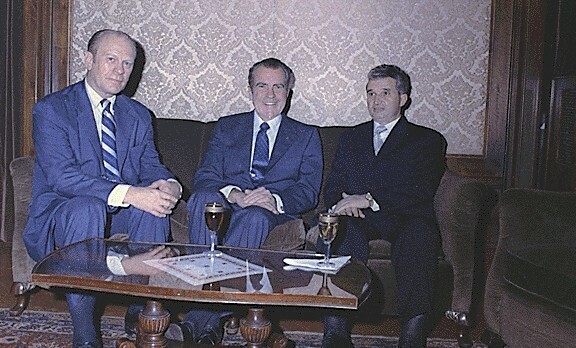 Richard Nixon visited Romania during this time, and Ceauşescu was received by many foreign leaders. He was viewed as a potentially reforming communist, and was courted by the West. 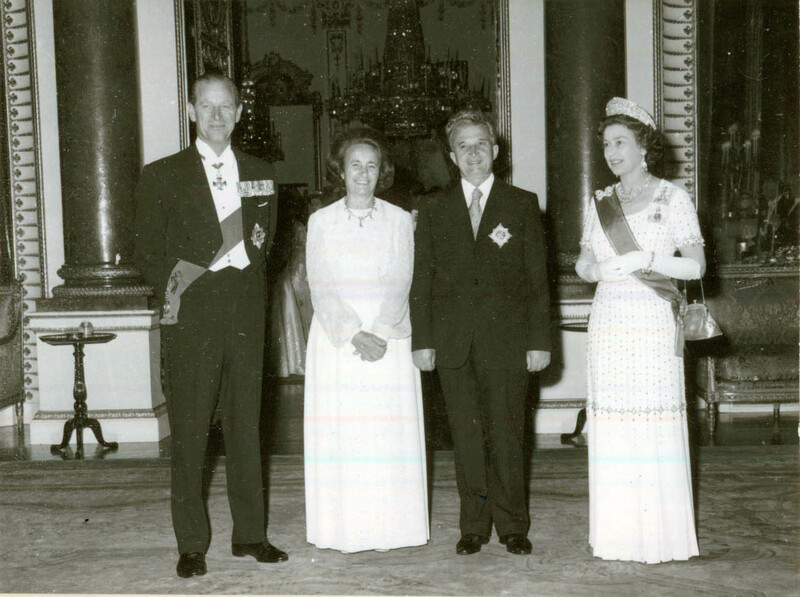 Ceauşescu received the Danish Order of the Elephant (what a title!) and honorary Knight Grand Cross of the Order of the Bath from Queen Elizabeth. One of the early indictors of trouble was in the mid-1960’s when the Government of Romania made abortion illegal, divorce more difficult, and introduced other policies to increase the country’s low birth rate (women with 10 or more children were called heroine mothers). This led to increased birth rates but also increased child abandonment. In the 1970’s Ceauşescu began to pursue a national transformation program, similar to China’s cultural revolution. He admired North Korea’s Kim Il-sung and China’s Mao Zedong, and began to actively develop his own cult of personality. He continued to set his own foreign policy independent of Moscow, and was one of only 3 communist countries to participate in the 1984 Summer Olympics in Los Angeles. During the 1960’s and 70’s, Romania borrowed large amounts of money from Western countries to finance economic development. By the 1980’s, this debt was becoming an oppressive burden, so Ceauşescu ordered that the debt be repaid as quickly as possible. Most of the country’s food and industrial production was exported to get foreign currency for this purpose, and although the people understood why it was happening, they suffered greatly. Food, heat, and electrical rationing were implemented. Getting sufficient food was very difficult as the shops were empty. Ceauşescu lived in denial of this and state television broadcast propaganda showing full stores and reported record agricultural production. 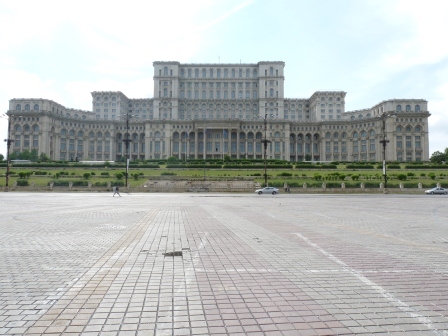 It was in this climate of restraint and suffering that in 1983, Ceauşescu began construction of a white elephant. He ordered that a hill in the city of Bucharest be cleared to make way for a grand palace, resulting in the destruction of 28 churches and synagogues and 30,000 residences. Ceauşescu intended that he would live in the palace and that the entire national government would operate from there (the presidency, government, parliament, and high court). 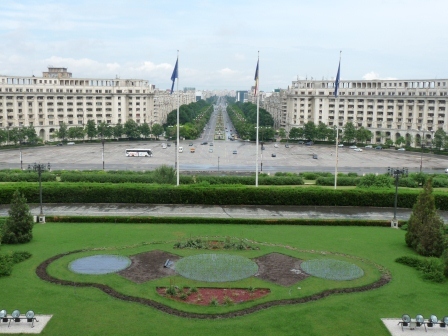 Extending in front of the palace, he built the grand Bolevardul Unirii (Union Boulevard) similar to the Le Champs Élysées in Paris. 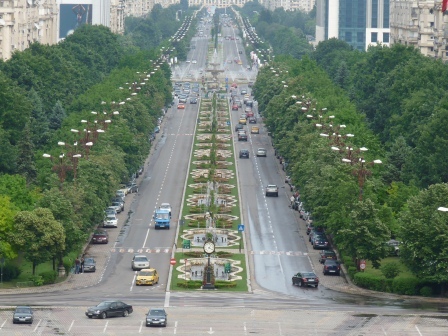 Originally named Victoria Socialismului (Victory of Socialism Boulevard), it extends for 3.5 km (just over 2 miles) and is lined with fountains. The Palace is rectangular in shape, 270 meters (900 ft.) x 240 meters (700 ft.), has 12 stores, and a total of 3.7 million square feet. It was constructed almost entirely using Romanian labour and materials. It is the world’s 2nd largest building by surface area (after the Pentagon in Washington, D.C.), but has the largest square footage and was the most expensive to build. 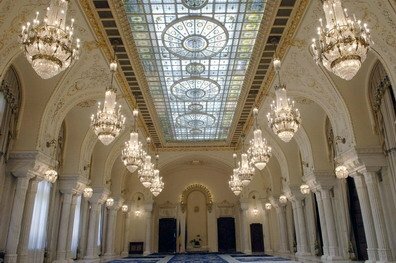 This lavishness was one of many of reasons why the starving Romania people were so upset. In December 1989, demonstrations began in the city of Timişoara, and the harsh government crackdown provoked an angry response from the people. The uprising quickly spread to the capital of Bucharest and on December 21st Ceauşescu attempted to give a public speech but was shouted down by protesters. People watching on television saw that he was unaware of how serious things had become. He appeared shocked and confused by the people’s response. By the next day protests had spread across the country and the mysterious death of the defence minister led to the army siding with the people. Nicolae tried to address the people again, but he and his wife Elana barely escaped by helicopter when they began throwing rocks and stormed the building. They were soon captured and became the last people executed in Romania before capital punishment was abolished 13 days later. It is interesting to note that Ceauşescu was stripped of his Danish Order of the Elephant by Queen Margrethe II of Denmark on December 23, 2 days before his death, and of his Knighthood by Queen Elizabeth on December 24, the day before his death. Elizabeth also returned the Romanian Order that Ceauşescu had given her. I find it remarkable that these things weren’t done earlier in his regime, which was widely regarded as being dictatorial, but only after he was overthrown. The whole business seems pretty transparent, responding to the tide of public opinion rather than individual merit. 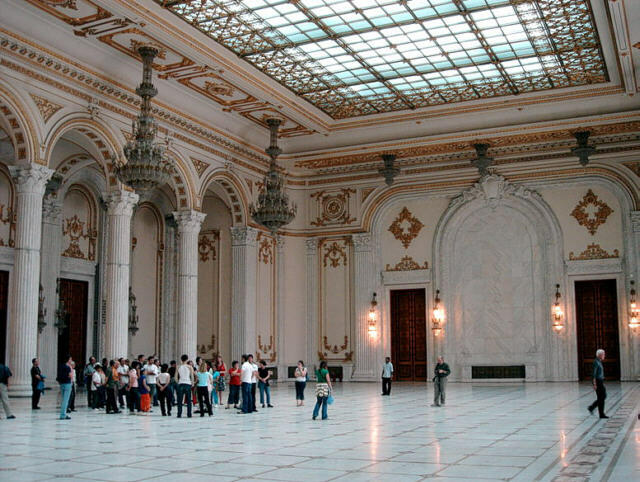 For a while the people of Romania considered demolishing the Palace of the Parliament. It reminded them too much of Ceauşescu. The building was complete but the interiors unfinished. It sat this way for 5 years before they decided to finish the main areas and later began using it as the seat of their government. Today it is one of the grandest palaces in Europe, constructed in a neoclassical style, but with the advantage of modern construction techniques. Its main rooms are much larger and almost as grand as those of many other European palaces (e.g. Schönbrunn in Vienna, Versailles outside Paris, Sansoucci Park palaces in Potsdam). Some of its carpets are so big they had to be manufactured in place (they actually moved in the carpet weaving machines), and it takes 80 people to move one of them! If you’re interested, the palace is available to rent, but not for private parties. The only private event ever held there was the wedding reception of Romanian gymnast, defector, and national hero Nadia Comăneci and American gymnast Bart Conner in 1996. 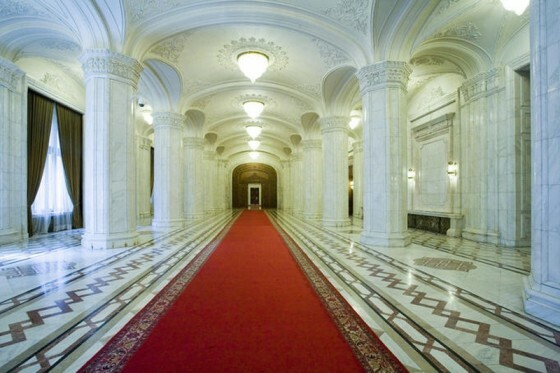 This entry was posted in Europe, Travel and tagged Bolevardul, Boulevard, Bucharest, Casa, Ceaucescu, Ceauşescu, Civic, Comăneci, Europe, Gheorghiu-Dej, House, Nadia, Nicolae, palace, Parliament, Republicii, Romania, Socialism, Socialismului, travel, Union, Unirii, Victoria, Victory on June 12, 2012 by dreambigliveboldly.